PRACTICE AREAS: Family Law, Labor Law, Administrative Law, Ante nuptial Contracts; Bills of Legal Costs, Blacklisting’s, Business Law, Civil and Criminal Litigation; Civil, Civil Unions, Commercial Contracts; Commercial Drafting, Commercial, Contracts, Conveyancing (buying/selling and transfer of immovable property), Debt Collection; Divorces; Evictions, General Practice, High Court Practice, Labor Disputes; Leases, Liquidation, Litigation (Civil), Litigation (Corporate), Litigation (Criminal), Litigation (High Court), Litigation (Magistrates Court), Matrimonial, Partnership Agreements, Notarizing of documents; Wills & Deceased Estates. Thank you for affording us the time to discuss your debt collection, notary and/or legal requirements and for offering us an opportunity in this regard. As a valued prospective client, we wish to emphasize the importance of gaining one another’s trust and of building towards a strong and mutually beneficial business relationship. Being a small firm we believe we can offer you a personalized and individual service, which will ensure your name does not get lost (in the system). The staff at Wollnik and Associates Inc. are committed to client satisfaction and strive to provide their clients with a service, which is expedient, economical, and feasible, backed by 18 years of service and experience. We offer our clients a wide range of efficient services ranging from sending letters to successfully processing legal claims through the South African Magistrates and High Courts if need be. The staff at Wollnik and Associates Inc. are dedicated and performance driven and creatively tackle all obstacles and reasons offered by debtors and by doing so, adding necessary pressure to get paid. Over the years, we have built up a steady clientele base, many of which have entrusted us with their legal matters over an extended period. 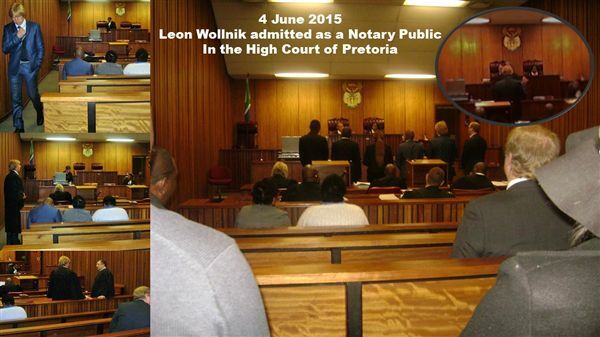 Wollnik and Associates Inc. deliver a high quality, cost-effective range of legal services to clients. We provide advice on and undertake matters with experience, energy, and professionalism. We work closely together with our clients. No client's affairs are compartmentalised into unconnected issues of law. A constructive overview at a senior level is always taken. Independent Attorneys doing work from our offices in Randburg, Wollnik and Associates Inc. deliver a high quality, cost-effective range of legal services to clients. We provide advice on, undertake matters with experience, energy and professionalism, and believe that this is the foundation of our success to date. We look forward to meeting with you in the near future in the hope of establishing a mutually beneficial working relationship suitable to all parties concerned. Clients instruct Wollnik and Associates Inc. nationally. We are accessible by telephone, fax, and e-mail. We also travel to meetings if required by the client. Wollnik and Associates Inc. is not a legal factory offering a mass-produced legal product. We find that our clients often prefer an independent approach. In our experience, effective personal case-handling is more likely to produce sound results. Wollnik and Associates Inc. look to input not only careful legal work and precision but also the determination to keep matters moving. We aim to work in clients' real interests with energy and pragmatism. 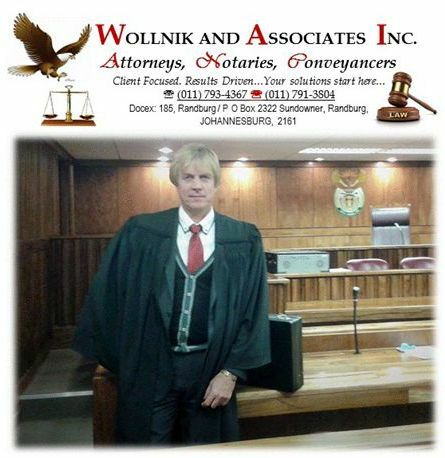 Wollnik and Associates Inc. always try to open up the legal process by giving advice and explaining options to clients in a concise and straightforward way, identifying clear courses of action whatever the technical or legal complexities of the subject and furthermore advising the client of the cost of such course of action. Our policy is to offer our clients regular feedback on their matters and to keep them in the picture at all times. Wollnik and Associates Inc. always aim to approach legal work in a financially-disciplined way. We operate at competitive rates. Our fee arrangements are both transparent and settled according to the options open to our clients. The firm generally charges by reference to time spent, but we often agree fixed fees for specific projects or in some cases risk-adjusted funding structures. Consular notarial services are rendered to South African citizens and foreign nationals requiring South African official (public) documents to be legalized for use abroad. ... Legalization therefore basically means the process followed by which the signature and seal on an official (public) document is verified. Marriage, Birth, Death, Single Status, Divorce, Police Clearance, Power Of Attorney, Copies Of ID Pages Or Passports, Educational Documents And Others. Certain documents are required by law to be notarially executed, in which case a notary has to draft the document which is then signed and witnessed in the presence of the notary. These documents are known as notarial deeds, and include, inter alia, ante- and postnuptial contracts, deeds of servitude, deeds of cession of usufruct, notarial leases, trust deeds of donation and notarial bonds. Such documents are kept in the notary’s safe keeping and the notary is also required to keep a protocol and register of all the documents drafted by and attested to before him. Besides notarial deeds, a notary is furthermore needed for the noting of protests regarding a bill of exchange as well as Notary Apostille & legalization services which include attestation, authentication and notarising of documents for use in foreign countries. Whether you are the plaintiff, defendant, applicant or respondent, it is important to know your rights, options, and recourse available in South African courts when seeking to resolve disputes, collect debts, or enforce contracts. I will provide a comprehensive overview of the basic concepts involved in litigation, which every person should be familiar with, even if you are not an attorney. In addition, what the alternative dispute resolution process entails. Alternative dispute resolution is becoming more and more popular to resolve disputes between parties. With that being said, there are, however, numerous instances where approaching the court, or even summonses to appear is unavoidable. Before one embarks on a process in the courts, it should be established what relief is sought. In other words, you should decide what the ideal outcome is that you are looking for. The relief sought when going to court in a civil matter or dispute, is usually a demand for payment of a sum of money owed to you, demanding damages or performance in terms of an agreement, which is basically the fulfillment of an obligation by the other party. Generally, the first step in the legal process is a letter of demand, which is sent to the other party. A letter of demand sets out the cause of action on which the demand is based, and the other party is then given time to either reply or comply with the demand. If the demand is met, no further steps will be taken. Should the demand not be complied with, the matter can be referred to court. Jurisdiction refers to the authority or competence of a certain court to hear a matter and to be able to grant relief in respect thereof. One should determine whether the High Court, Regional Court, or District Court, or even a small claims court has jurisdiction to hear the matter. The court’s jurisdiction will be dependent on the type of the claim and the value of the claim. The monetary values of different Regardless of the monetary jurisdiction of the courts in terms of the rules, the parties may however still agree to the jurisdiction of a specific court. This will have some implications when seeking for costs in a matter, but will not be discussed herein. There are certain matters which may only be heard in the High Court regardless of the quantum involved in the claim or dispute. Once the correct court, whether High or Magistrate’s, has been established, one must determine which seat or area of the court. As a general rule, a court will exercise jurisdiction on the basis that the defendant is resident or domiciled in the area of the court or if the cause of action arose in that area. Once it has been determined in which court a matter is going to be referred to for litigation, it is necessary to decide whether to proceed by way of trial (action) or by way of a motion application). In determining whether the appropriate process is by way of action or motion, one should ask whether a material dispute, in fact, is anticipated or not. If a dispute of fact is anticipated, it is generally best to proceed with an action. This eventually ends up at trial, where witnesses may be called to lead oral evidence. On the other hand, if no material dispute of fact is anticipated, then motion proceedings are most likely the fitting process to be followed. In motion/ application proceedings the matter is determined based on the papers. This means that submissions are made by way of sworn affidavits, and generally, no oral evidence is allowed. In a trial, the evidence before the court can be tested by cross-examination. In the application process, it is sometimes more difficult for courts to decide between conflicting versions. The advantage, though, is that an application is usually speedier and more cost effective than action proceedings. An action is instituted by way of the issue and serving of a summons. The purpose of the summons is to bring the plaintiff’s claim to the attention of the defendant by informing the defendant of the nature of the plaintiff’s cause of action and the claim made. The summons must be served on the defendant by a sheriff in terms of the rules of the court. After having been served with a summons, the defendant will generally have 10 days to give the plaintiff its notice of intention to defend the action. After such notice have been given, the defendant should either deliver its plea to the particulars of claim in the case of a combined summons, alternatively, in the case of a simple summons, the plaintiff will deliver a declaration setting out its cause of action in more detail. The defendant’s notice of intention to defend must clearly and in accordance with the rules of the court stipulate an address whereat the defendant will take receipt of further pleadings and notices. This is typically the address of the defendant’s attorneys should the defendant wish to be represented by legal counsel, which is recommended. Should defendant not enter into appearance to defend within the prescribed time, or where the defendant has failed to deliver its plea after receiving a notice of bar from the plaintiff, the plaintiff may apply for default judgment without further notice to the defendant. Where default judgment is granted, the plaintiff may demand compliance with the judgment. Sometimes it happens that the defendant was never aware of the service of the summons. In these circumstances it is possible for the defendant, on learning of the judgment against him, to apply for a rescission of judgment. This application is supported by an affidavit which must provide a satisfactory explanation for the defendant’s failure to give notice of intention to defend and explaining the nature of the defense that will be raised. This application needs to be brought within one year of the defendant first having notice of the judgment against him. Due to the complexities involved regarding these applications, it is advised to seek legal assistance. Where the plaintiff is seeking speedy judgment at an early stage without the delay and expense of a trial, summary judgment can be sought in certain circumstances when an action is defended. In most instances, the plaintiff will be granted summary judgment where the defendant has no bona fide defense and has entered an appearance to defend solely for the purposes of delaying the action. Such application can only be brought where the defendant has delivered a notice of intention to defend, the plaintiff’s case is based on a liquid document or a liquidated amount of money, the delivery of specified movable property, or ejectment from property, and the plaintiff believes that the defendant does not have a bona fide defense and is merely trying to delay judgment. During the pleading phase of litigation, either party has the option to file an exception to any pleading, where, for example; the pleading is vague and embarrassing, or it lacks the statements necessary to sustain a cause of action or a defense. An exception to a pleading needs to be delivered before any further steps have been taken in response to a pleading of the opposing party. The next major step in the action process is for the defendant to file its plea. This is the document that set out the defense upon which the defendant relies and must contain a paragraph-by-paragraph reply to every allegation made by the plaintiff in the particulars of claim. The defendant will admit, deny or confess and avoid each of these specific allegations. Where a defendant fails to deal with a specific allegation, then the allegation will be deemed to be admitted. In addition to the plea, the defendant may raise a special plea with a special defense, which will either destroy the cause of action or postpone the operation thereof. The defendant may also decide to file a counterclaim should it have a separate cause of action against the plaintiff. The defendant is obliged to file a counterclaim at the same time he/she filing the plea. The plaintiff does not need to deliver a notice of intention to defend the counterclaim, but the plaintiff must then deliver a plea to the counterclaim, in which the plaintiff must set out its defense to the counterclaim. The plea to the counterclaim must be delivered at the same time as a replication if one is to be delivered. Once the parties have filed all its pleadings, the pleadings are considered to be closed. Now, before the matter can go to trial, there are many crucial procedures that need to take place. Very briefly, this includes discovery, applying for a trial date, having a pre-trial conference, requesting security for costs, and possible settlement discussions. Discovery is one the most important steps in preparing for trial and is based on the principle that a party is entitled to have knowledge of the matter of all the documentary evidence, including tape recordings and e-mails, which the opposing party possesses which are relevant to the matter, prior to the hearing. The parties disclose to each other all relevant documents and tape recordings that they or their agents have in their possession or under their control. Discovery is made by way of an affidavit to which a list is annexed listing all the documents in the discovering party’s possession. Generally, a party will not be allowed to use any documents that he has failed to disclose in response to a request for discovery. There are however certain exceptions to this general rule, which will not be discussed in this document. Once the preparations are complete, the matter may be set down for trial. This is where each party will lead oral evidence, which in turn may be tested under cross-examination by the opponent, in order for the court to come to a decision. Also known as motion proceedings, the application procedure is based on the exchange of affidavits. The party bringing the application is known as the applicant and the party opposing the application is the respondent. The applicant will issue a notice of motion which states the claim and the relief sought. This notice is supported by the applicant’s founding affidavit together with annexures thereto, which will be used to support its claim against the respondent. The respondent will then have the chance to oppose and subsequently, file its answering affidavit. In this affidavit, the respondent will address the applicant's allegations in the founding affidavit. The applicant will have the opportunity to respond in a replying affidavit. The parties must include all the relevant facts in the affidavits, as the argument in court will be limited to oral argument by the representative of both parties. No further evidence will be submitted once both parties have had a chance to submit affidavits and the matter is set down for hearing. Since all evidence is placed before the court in affidavits, a number of procedures that take place in action proceedings are not applicable in application proceedings. This brief overview outlines the process involved in both action and motion proceedings and also illustrates how the process can become complex fairly quickly. It is therefore recommended that one obtains legal assistance in litigation proceedings, in order to be certain that all the procedural steps are followed according to the rules of the court. It is better to have someone who is well versed in presenting evidence to the court and to assist during the process. Contact Wollnik and Associates Inc. for sound advice and assistance in any civil litigation process you may be involved with or implicated in. Provide their customers with an effective debt collecting service. The staff at Wollnik and Associates Inc. persistent yet understanding which ensures accurate negotiating skills. Monitor debtors prearranged payment plans and motivate regular payments through corrective measures. Bad debt should be handed over after a 90-day period has lapsed. Many creditors have already broken the terms and conditions of the credit granted at this stage, causing the relationship to sour. Generally, all forms of communication have been ignored or the debtor has come up with a string of excuses or broken promises, which normally have not materialized causing the creditors to express their concerned lack of response for payment. A collection problem exists and the account should be handed over for debt collection after the prescribed 90-day period. WHY UTILIZE OUR DEBT COLLECTION SERVICES? Once Wollnik and Associates Inc. become involved the debtor knows that the collection of payment is now a reality and the sooner he settles the outstanding monies the lesser the pressure and the chances are for having a judgment against his name. THE LONGER THE OUTSTANDING AMOUNT IS OVERDUE-THE HIGHER THE RISK AND CHANCES ARE OF NON-RECOVERY. Detailed copies of COD/ invoices, statements, delivery notes, agreements, or bank statements. The detailed information regarding the debtor- Full names, ID Number, Physical Address, Next of kin, Home, Work, fax and cell numbers, email and postal address. Debt collection is time-consuming and requires persistence and a continuous follow-up procedure. The aim is to place immense pressure and responsibility on the debtor to acknowledge liability and ultimately to settle the debt through strong negotiation skills. Most accounts are settled through our standard collections phase, should the debt still be unpaid the debt will follow into the legal collections phase. During the standard phase, the whereabouts of the debtor will be traced, confirmed and updated followed with an intensive strategy containing letters, telephone calls, faxes, inquiries and any other way of personal contact. A payment plan will be negotiated and the financial position of the debtor established. Ultimately, settlement of the account will be achieved. Should all of the above efforts fail the next phase of legal collections will follow. Some debtors only respond on court proceedings, which, unfortunately, are time-consuming, and an expensive exercise, but a fruitful one in many cases where we institute legal action on your behalf against any debtor who has the means to pay but remains unwilling. DOES THE COURT ACTION ENSURE THAT I GET MY MONEY? This depends on the status of the Defendant. If the defendant is insolvent or unemployed and has no assets then recovery is doubtful. The same applies to companies that have ceased operations. WHAT DOES IT COST THE CLIENT? Each party is responsible for their own fees. If the legal action is successful, legal costs can be claimed from the debtor over and above the capital amount sued for. However, these recovered costs are only on the court tariff, which amounts to approximately one-third of the legal costs incurred by a client. If no response from the Defendant is received, Wollnik and Associates Inc. will apply for judgment and when it is passed, a judgment is issued. Wollnik and Associates Inc. will request from the court either an order to get a deduction from the salary of the defendant or request the sheriff to remove furniture in order to pay for our claim. The latter is done by issuing a warrant of execution, which empowers the sheriff to claim payment or to attach property of the defendant in the value of the judgment amount. If you have a valid claim against the debtor, it is seldom necessary to attend court as the Defendant/debtors prefer to settle the claim before wasting their time in court, especially if they know they will lose. However, sometimes court hearings do take place especially in defended matters where the claim is in dispute. All parties will then have the opportunity to give evidence. The legal fees in defended court hearings will be for the client's account. Assuring of our best service at all times. Company registration documents i.e. (CK1, CK2) and/or Certificate of Incorporation (CM1, CM29/CM9 (name change), CM46.